Josh McDowell, an apologist and evangelist, spoke at Southern Evangelical Seminary's Christian Apologetics conference on three culture changes that create a "perfect storm" that challenges and poses a threat to the church. One of the things that impressed me greatly about Pentecostal, Full Gospel and Spirit-filled Christians was the way they worshipped, praised and magnified God! In the Evangelical Lutheran Church we sang all the wonderful hymns of praise to our Lord and heard sermons extolling God, but to hear individual believers voice their praise to the Almighty in thanks for His miraculous intervention in their lives was foreign to me. It was like reliving the Book of Acts to hear testimonies of conversions from alcohol and drug addiction, gambling and false religious cults. Add to that, miraculous healing from tumors, cancers, blindness, deafness, arthritis, ulcers and other diseases was mind - boggling! I knew that God had healed my Mother in 1920 under the ministry of Evangelists Storm and Monson in Norway. Other gifts of the Holy Spirit like prophesying and speaking in tongues, however, were totally foreign to me. MY DAD WAS INSTANTLY HEALED! When my Dad was instantly healed of serious gallbladder problems and heart disease in March 1956 through Oral Roberts’ radio Ministry, the Holy Bible became alive to me! It is quite possible that if I had not seen the reality of the Gospel working in my Father’s miraculous healing and transformation through the Baptism of the Holy Spirit, I would not be in the Ministry today! Although the Holy Spirit strove mightily with me during Revival Meetings in 1951 with Pastor Sylvan Johnson at S.L.B.I (now Lutheran Collegiate Bible Institute) Outlook, Saskatchewan, I did not have the courage to totally follow Christ! In 1957, following my Father’s amazing experience of the Baptism of Holy Spirit, I was again drawn by God’s love and mercy to the Cross of Calvary in total repentance and submission to His will, and call on my life! For the next six years I devoured God’s Word and prayed much for the Holy Spirit’s guidance as I worked in the secular world, while preparing for the Ministry of Deliverance into which He was divinely leading me! It is such a blessing to have received the gift of prophecy (1 Cor.12: 10) in order to exhort, edify and comfort God's people. Praising and magnifying God, however, is an absolute essential in the Christian life in order to keep up a vital contact with our Heavenly Father! Our lives are like a body of water. If water flows in but has no outlet it becomes stagnant, and all life there ceases to exist. Then death takes over. The Dead Sea is a good example of that! The movement of water into and out of a body of water creates an atmosphere conducive to life. The constant intake and outflow causes a cleansing action, making the water fresh. This analogy shows us that receiving from God without praising Him and sharing His goodness with others makes us stagnant, and spiritual death ensues! "Praise ye the Lord. Praise God in His sanctuary; praise Him in the firmament of His power. Praise Him for His mighty acts: praise Him according to His excellent greatness. It is incumbent upon us to thank and praise God for His gifts to us, as well as TESTIFY to others of His great goodness, mercy, love and power. I can’t imagine many of today's Evangelical preachers meeting the old ‘Apostle to the Gentiles’ and spending a few hours or days with him! They would have to ask him to leave, put him in a basement room and shut the door and stop preaching from the Epistles he wrote. Or they would have to repent of their ignorance, stupidity, hardness of heart, and be filled with the Holy Ghost themselves. St. Paul would certainly have to rebuke them and set them straight! It would be a very interesting meeting indeed! I BELIEVE IN THE HOLY GHOST! The Church Fathers who formulated the Apostles Creed certainly believed in the Holy Ghost and in every instance in the Bible where believers received the Baptism of the Holy Ghost they spoke in tongues and magnified God! Again the Bible says, "He that speaketh in an unknown tongue edifieth himself..." (1 Cor.14: 4) Certainly we need to edify and build up ourselves in Christ, more now than ever, as we approach the end! GIFT ARE ON DANGEROUS GROUND! The Pharisees accused our Saviour of healing the sick and casting out devils by the power of Satan. Since He was doing these works “by the Spirit of God” they essentially called the Holy Spirit a devil! Here is my advice: If you cannot understand some of the things God is doing, don’t fight against Him. Don’t make the mistake the Pharisees made! Also remember, the ‘gift of tongues in concert with the ‘gift of interpretation’ is equal to prophecy! 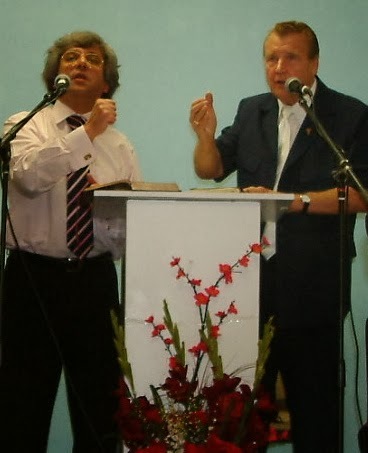 When a leading Baptist Evangelist, Dr. Hyman Appelman conducted a glorious revival crusade in our church (1972), I asked him: "Have you been filled with the Holy Ghost? Do you speak in tongues, Brother Appelman"? My good Jewish friend, Dr. Hyman Appelman replied, "The Holy Ghost got to me before the Baptists did.” No wonder Billy Graham stated: "Dr. Hyman Appelman is one of the most powerful preachers I have ever heard"! “Brother Wurmbrand, I was raised in the Lutheran Church but I have been filled with the Holy Ghost and I speak with other tongues. You are a Lutheran Pastor who has been tortured and suffered terribly for Jesus Chris. 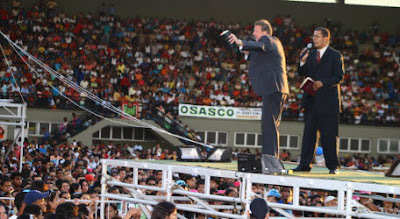 Have you been filled with the blessed Holy Ghost and spoken in other tongues? Pray often with praise & thanksgiving. Witness at every available opportunity with wisdom & God's leading. Another thing that has set ‘Spirit-filled, Full Gospel people’ apart from other Christians, is the fact of a POWERFUL PERSONAL WITNESS to their fellowmen, of the crucified and risen Christ Who is the same yesterday, today and forever! The Bible records that they went with great haste to bring His disciples word of the resurrection of Jesus Christ from the dead. They went with great haste because they had an urgent message to tell! What a message we have to tell the world! Our wonderful Lord and Saviour Jesus Christ died for our sins and rose again for our justification, and is even now alive, interceding for us at the Father's right hand. Hallelujah! There is no secret, hidden agenda in God's Word. Everything is open and above board with our Lord. The message is clear. Once we have heard the truth and experienced the blessings of Christ's salvation, we are duty bound to go and tell someone else the Good News! The Bible states that they returned to Jerusalem and were constantly in the temple praising and blessing God. They also went from house to house - with great joy and gladness - breaking bread and fellowshipping around God's Word. The Scripture says they were continually magnifying God. To MAGNIFY GOD means to not only glorify and worship Him, but to lift Him up so high that He appears larger in the eyes and ears of the hearers than He had seemed to them earlier. Most Christians make God look very small. We are to magnify Him so that everyone may begin to understand how marvelous and wonderful our Lord really is. Oh, how GREAT is the LORD our GOD! Only Spirit-filled people really and truly praise and magnify God with all their hearts! Only those who have been “born of the Spirit” and filled with God’s presence, feel at home in His presence! After listening to the dry, dead, monotone sounds of the average Jehovah Witness or fundamentalist preacher, you certainly wouldn't be convinced that God is alive, real and moving by His mighty power in this generation! Much of the theology that is expounded has to do with the past and future, with a glaring omission of today! Especially is this noticeable in regards to the present day ability of the Omniscient, Omnipresent, Omnipotent and Eternal God to work miracles among His people on earth in this Twenty-First Century! It's the same old story as that of Mary and Martha. For years, Herbert W. Armstrong called his radio and TV talk show The World Tomorrow! Others like the Jehovah’s Witnesses speak constantly about the coming New World or Kingdom Age! While we are thrilled about the Millennial Reign of Jesus Christ and Life Everlasting with Christ, we have something to offer people who accept His Gospel, here and now! The Eternal God is the God of the NOW! OF JESUS: NOT LIKE THE SUBSTITUTES OF TODAY! In the face of persecution, temptation, sickness or death, let us hold onto our confession of faith and belief in Christ Jesus our Lord! Let us constantly practice what the Bible teaches, glorifying and magnifying God! When doubters, skeptics and unbelievers scorn us for believing in and proclaiming a Risen Saviour, Who still forgives sinners, brings peace to the troubled and healing to sick, as well as baptizes with the Holy Ghost and power, let us tell them, "YOUR GOD IS TOO SMALL"! 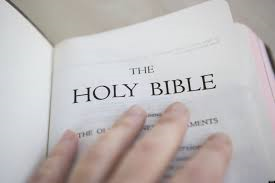 In the 1960s as a Commercial Traveller I met a variety of people in my travels and when they heard that I was “Religious” we often had animated discussions about the Bible. A fundamentalist preacher who was rabidly anti-Pentecostal, made this fervent statement: "Divine healing is not for me and the Baptism of the Holy Ghost is not for me.” I replied: "You are right Sir, these gifts are not for you, but they are for me because I believe. Since you do not believe and desire these gifts, God will not force them upon you". MIRACULOUS WONDERS IT IS TODAY! We serve a great big, wonderful God Who keeps His Word. And since Jesus Christ died and rose again for our total salvation, we are recipients of His goodness, mercy and love! If ever there was a time when Christ’s Church needed to ‘stand up to the plate’ and prove to the world that Jesus Christ is the Son of the Living God and the ONLY Saviour of the world, it is TODAY! The “enemies of the cross” have gathered a cacophony of the ‘weird and wonderful’ across the spectrum of left wing Christ rejectors, New Age gurus, Hollywood lapdogs and sexual perverts, to publish down right lies, distortions and manufactured falsehood about Jesus Christ and His Church! There is nothing impossible with Him Who is the Alpha and Omega, the First and the Last, the King of Kings and Lord of lords and the Only Saviour of the world. 5.) TO ALL WHO NEED FORGIVENESS, DELIVERANCE & ENCOURAGEMENT, Christ Jesus stands ready to help you. Without hesitation, I invite you to call upon the Name of the Lord and be saved. There is absolutely nothing that God is unable to do. He can do all things He wills to do because He is all powerful (omnipotent), all knowing and all wise (omniscient) and everywhere present at all times (omnipresent). SPIRIT GIVES YOU A NEW IMPETUS. “Afterward He appeared unto the eleven as they sat at meat and upbraided them with their unbelief and hardness of heart, because they believed not them which had seen Him after He was risen. Dear friend: Please write with your prayer requests. We will pray for you and I will write you back! When you write, please ask for a free prayer cloth over which we have prayed with faith in Jesus' Name, for your deliverance and salvation! 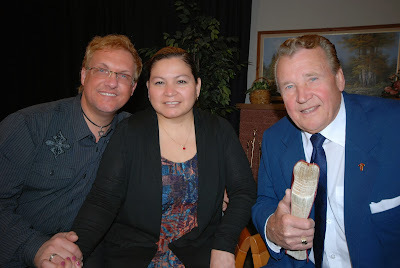 Missionary Dean & Dr. Ruth Milley with Pastor Max Solbrekken on TV in 2012. 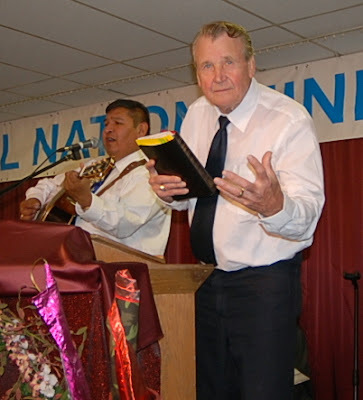 The one hour Video extols the grace of God and the Blood of Jesus Christ in Dean's 1988 deliverance from evil spirits that had bound him since childhood. His story is 'From Hell's Highway to the Mission Fields'. In 1988, Dean had written his suicide note and was on his way to create a head-on collision but ended up at the F.G Bursey Memorial Tabernacle where Max Solbrekken was preaching at the May Central Conference of the Pentecostal Assemblies of Newfoundland. God was moving in great Revival power. About 500 people were gathered outside unable to get in. Dean was drawn by the Holy Spirit into the building, just as Pastor Max was calling for someone who had planned to take his life. He pushed his way through the crowd to the altar. When the demons were cast out in JESUS' NAME, they bellowed like a bull and he was free at last. Hallelujah. The one-hour video is ready for mailing. Send $20 with your proper postal address to MS World Mission Box 44220 RPO Garside, Edmonton, AB T5V 1N6 Canada. JESUS CHRIST MUST AWAKEN: FORWARD MARCH, BROTHERS & SISTERS IN THE LORD! TAKE ME INTO THE HOLY OF HOLIES! Take me into the Holy of Holies; Take me in by the blood of the Lamb. Take me into the Holy of Holies. Take the coal, Touch my lips, Here I am. May God grant us His mercy & grace! Amen. It looks like the Obama administration is separating the military from the American people. The soldier said a chaplain interrupted the briefing and challenged the instructor’s assertion that AFA is a hate group. The soldier, who is an evangelical Christian, said the chaplain defended the Christian ministry. “He kept asking the instructor, ‘Are you sure about that, son? Are you sure about that?’” he said, recalling the back and forth. Later in the briefing, the soldiers were reportedly told that they could face punishment for participating in organizations that are considered hate groups. That considered, the soldier contacted me because he is a financial contributor to the AFA ministry. It’s not the first time the Army has accused conservative Christian groups of being domestic hate groups. Earlier this year, I exposed Army briefings that classified evangelical Christians and Catholics as examples of religious extremism. Another briefing told officers to pay close attention to troops who supported groups like AFA and the Family Research Council. 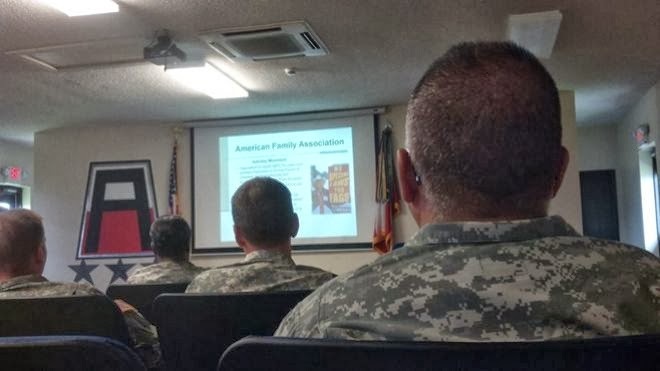 “When we see behaviors that are inconsistent with Army Values – don’t just walk by – do the right thing and address the concern before it becomes a problem,” the officer wrote in an email to his subordinates. At the time the military assured me those briefings were isolated incidents and did not reflect official Army policy. If that’s true, how do they explain what happened at Camp Shelby? I contacted the Pentagon for an answer but they referred me to Army public affairs. And so far – they haven’t returned my calls. And their claim that the classifications are “isolated” is not washing with AFA. “The American Family Association has received numerous accounts of military installations as well as law enforcement agencies using a list compiled by the Southern Poverty Law Center, which wrongfully identifies and defames AFA,” reads a statement they sent me. 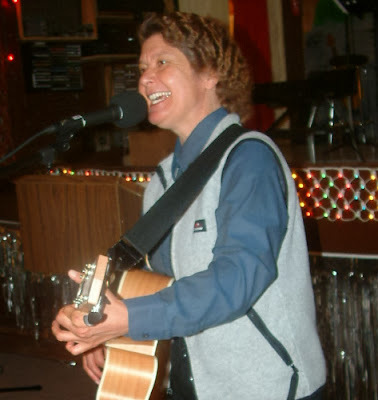 Fischer said their views on gay marriage and homosexuality are not hate – it’s simply a disagreement. “If our military wasn’t headed by a commander-in-chief who is hostile to Christian faith, these allegations would be laughed off every military base in the world,” he said. Hiram Sasser, of the Liberty Institute, told me the Army’s briefing is a smear. He recalled what President Obama said last year when Muslim extremists attacked our diplomatic outpost in Libya. Sasser said he wished the president and the Army would treat the American Family Association with the same deference and respect they show those who mean to harm us. “Why must the Army under this administration continue to attack Americans of faith and smear them?” Sasser wondered. Because it appears the Obama administration is separating the military from the American people – and planting seeds of doubt about Christians and some of our nation’s most prominent Christian ministries. Three volunteer Christian youth pastors have been temporarily banned from a Washington state middle school after parents heard from students that the three were proselytizing during lunch. KIROTV.com reports the Bainbridge Island School District has hired an outside contractor to conduct a “fact-finding” mission into the allegations concerning the three volunteer cafeteria supervisors. Meanwhile, one of the volunteers denied the allegations. "The only time church may have come in is when they say, 'What do you do?' my response is, 'I'm a youth pastor.' Even sometimes say I'm a leader because most of the kids don't know what a youth pastor is," said Danny Smith. "I don't wanna defend myself, I want to defend my motives. It's not about me, it's about why I'm there. It's not for evangelizing and it's not for proselytizing or recruiting, but it's just there to be there." The allegations concern what Smith and his cohorts said at Woodward Middle School. "I think it's a very dicey situation, I think they have to be really careful what they say," Leslie Krantz, whose eighth-grade son attends Woodward, told KIROTV. Darryl Martin, another parent, told the station: "If some of those volunteers were not there, taking the opportunity to meet my son, and help introduce him to other students, my son would spend most of the year eating lunch by himself." The district reportedly has said it might allow the pastors back on to campus, pending the investigation’s outcome. Meanwhile, Smith says he merely wanted to embolden the students -- and assist in their maturation. "I come here because I know that it's important for every student to know that they each have value and a purpose," he reportedly told a crowd of parents and school officials that recently convened to discuss the issue. the congregation of All Nations Church, High Prairie. his evil spirits who have come to steal, kill & destroy. Without doubt, Jesus Christ is Lord forevermore.! !